Carex Ice Dance is a variety that will grow in a variety of conditions, from nearly full sun to shade in average to moist soil. 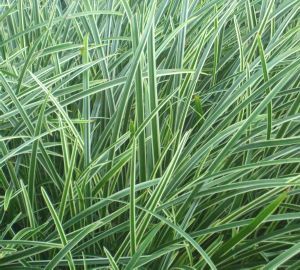 Unlike many other sedges, 'Ice Dance' is a slow to moderate spreader, that should be used as a groundcover or contained in pots. With its wide, strappy leaves, this Carex makes a bold statement in the garden. The leaves are dark green with bright white variegated edges. Small, cream, bottlebrush-like flowers are produced in mid-spring but are rather insignificant to the plant's overall ornamental value. 30cm in height. Spread dependent on taste! 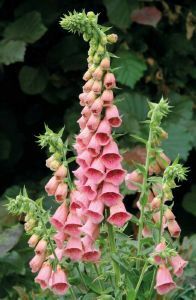 Digitalis x mertonensis, commonly called the Strawberry foxglove or Merton’s foxglove and often known by the marketing name "Summer King", and gets its name from the crushed strawberry pink trumpets set tightly on rigid stems. This striking and robust plant is a hybrid between the pink flowered Digitalis purpurea, our wild foxglove, and the yellow flowered Digitalis grandiflora.The resulting plant produces typical bell-shaped flowers in summer, which are a beautiful mix of the two shades. Warm pink, speckled flowers that are larger than the wild foxglove. The compact plants grow to around 90 to 120cm. Digitalis mertonensis has been awarded the RHS Award of Garden Merit (AGM). Dryopteris cycadina is a tall fern with elegant foliage and the stems covered in dark hairs giving it its distinctive appearance. The ‘Shaggy Shield Fern’ or ‘Black Wood Fern’ is so-called because of the dark, almost black scales covering the black leaf bases and crown. This, when contrasted with the bright green fronds, makes the plants extremely appealing. It has a strong habit of growth and robust leathery leaves the leaflets of which bear serrated margins. 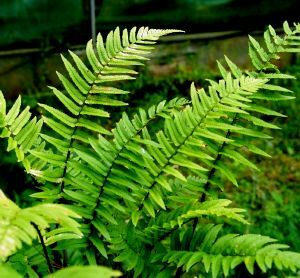 Dryopteris atrata is a synonym and exotic gardeners will notice the specific name, which acknowledges the plant's passing resemblance to a cycad. Ophiopogon planiscapus, is a small ground cover evergreen grass-like perennial in the lily family and is sometimes referred to as ‘Lilyturf'. It grows slowly from short rhizomes, and bears tufts of leaves, from which flowers emerge in racemes held on short stems above the leaves. 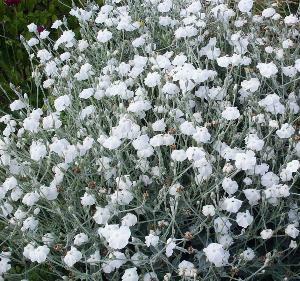 This plant is commonly used in rock gardens or raised beds as an ornamental plant; owing to its dwarf-like qualities it can be lost in borders, but makes an ideal edging plant. 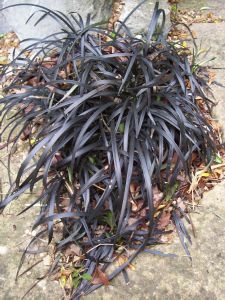 Ophiopogon planiscapus 'Nigrescens', ‘Black Dragon Grass' or Black Mondo Grass is a small, ground cover, evergreen grass-like perennial with almost black foliage in the lily family and is sometimes referred to as ‘Lilyturf'. 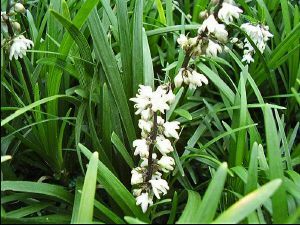 It grows slowly from short rhizomes, and bears tufts of leaves, from which flowers emerge in racemes held on short stems above the leaves. This plant is commonly used in rock gardens or raised beds as an ornamental plant; owing to its dwarf-like qualities it can be lost in borders, but makes an ideal edging plant.